Antiguo anillo. Oro de 18 k. Con estuche. Desconocemos que tipo de piedras porta. Peso total 9,1 gramos. Diámetro interior aproximado 1,8 cm. El estuche no se corresponde con la antigüedad del anillo. ARTICULO SUJETO A DISPONIBILIDAD DE STOCK, YA QUE TENEMOS TIENDA ABIERTA AL PÚBLICO. Los colores pueden variar ligeramente debido al flash de la cámara fotografía. Para su estado de conservación ver fotografías. Ver fotografías. Old ring. 18 k gold. With case. Know what kind of stones slide. 9.1 grams total weight. Interior diameter of about 1.8 cm. The kit does not correspond to the length of the ring. ARTICLE SUBJECT TO STOCK AVAILABILITY AS WE OPEN SHOP. Colors may vary slightly due to camera flash photography. For condition see pictures. See photos. 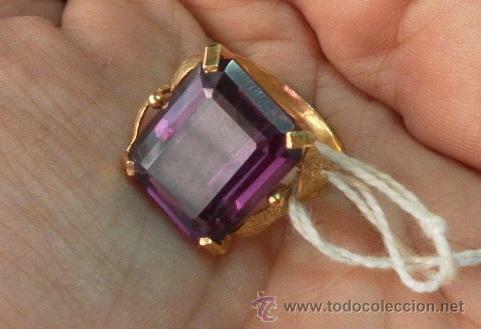 ANTIGUO ANILLO. ORO DE 18 K. CON ESTUCHE ORIGINAL. ANTIGUO ANILLO DE NIÑA, DE ORO DE BAJA CALIDAD Y GEMAS TALLADAS. LA CENTRAL PARECE UN ZAFIRO. Hora oficial TC: 06:12:14 TR: 113 ms.